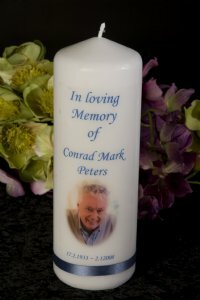 Our Memorial photo candle is a very special candle for those grieving the loss of a loved one. We are able to place your favourite photo of your loved on on the candle together w ith their name and date of birth and death. Perhaps you would like a special verse on the back or a symbol of something they loved. Choose from any colour for the writing and ribbon.